Can I print from my laptop computer? Click the "Web Print" tab to upload your document via a webform and to check the status of your print job. Print jobs will be charged against your assigned print quota. Click the "My Printers" tab to set a shortlist of your "favorite" printers. "Library Patron" are the two printers on the first floor near the Library Services Desk, "Library Lab" is the printer in the "Muserlian Instruction Lab", and "Library Cluster" is the printer in the computer cluster near the IT Help Desk. If you plan to print from your laptop frequently, click the "Driver Print" tab to find out how to install a printer driver that will let you print wirelessly directly from your document. For more detailed instructions and information about your print quota, visit the "Printing in the Library" help guide. For technical assistance, visit IT's "Printing On Campus" page, contact the IT Service Desk or call (315) 445-4579. How do I make an appointment with Tutoring Services? Tutoring is available through the Student Success Center which is located on the first floor of the Noreen Reale Falcone Library. Students can schedule their own tutoring appointments online. In order to schedule an appointment, you must first register for an account at https://lemoyne.mywconline.com/. Once registered, sign in with your new account information and click "Login" to get to the tutoring schedule page. For technical assistance with configuring your personal device to use the eduroam wireless network, contact the campus Information Technology Service Desk at 315-445-4579 or email servicedesk@lemoyne.edu. For more information about Eduroam or how to obtain guest access to the network, visit the Library's "College Wireless Network" guide or IT's "Connecting to the Internet" guide. Does library have a scanner? Yes, the library has a scanner located near the Library Services Desk. Is there double-sided printing in the library? Double-sided printing is still available in the Library. 3. Under the "Settings" heading, click on the "Print one-sided" button and select the option: "Print on both sides - flip pages on long edge"
If you are still having trouble, ask the IT Service Desk. How do I text (SMS) a question to the Library? Text your questions to (315) 510-4342. This service is staffed 24/7, except for some holidays. Note: the text (SMS) phone number connects to the Library's record message phone number, which includes upcoming hours of service information. Call the Library Services Desk (315) 445-4330 or visit http://resources.library.lemoyne.edu/contact for additional phone numbers. Can I print from a Library workstation? Most of the workstations in the Library can print to the networked printers using your print quota. 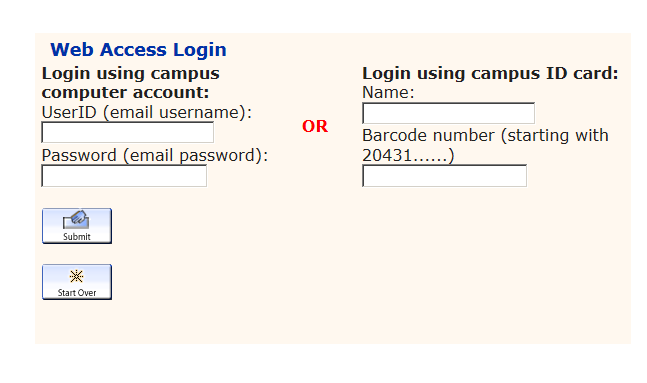 To access these workstations, you must first log in using your campus network username and password. Four of the six workstations nearest the Library Service Desk can print to the printer adjacent to them. The other two workstation, which are for guest access and requires no login, are for quick look-ups and are blocked from printing. In addition, all of the computers near the IT Service Desk, located in back of the library, are set up to print to nearby networked printers. For more detailed instructions, visit the "Printing in the Library" help guide. For technical assistance, contact the IT Service Desk or call (315) 445-4579. It depends! There are different styles depending on the discipline of study. Always ask your professor which one to use. Also, take a look at our Citing Sources Guide. For medicine there is the AMA Manual of Style Print copy at REF DESK WZ 345 .A511 2007 (10th Edition). For psychology, there is APA style adapted by Univ. of Southern Mississippi. See print copy of the Publication Manual of the American Psychological Association at REF DESK BF 76.7 .P83 2010 (6th Edition). For sociology, there is the American Sociological Association. Also see the Sociology Subject Guide. Historians use the Chicago Manual of Style Print copy at REF DESK Z 253 .U69 2010 (16th edition), also see the Handbook for Historians. The humanities tend to use the Modern Language Association style. See MLA style adapted by Lone Star College. Print copy of MLA Handbook at REF DESK LB2369 .G53 2016 (8th edition). For further help see Mendeley which is a citation management software. It formats your citations for you in all the above mentioned styles and many more right into your research paper Word file or into a separate Word file. Check the Visiting the Library page for maps and directions. In addition, the Noreen Reale Falcone Library is labeled building #5 on this campus map. Of you can find the library using this Google Map. Try viewing the Databases by Name. Take a look at Subject Guides. Search for the journal title in the Print and Electronic Journal Title List. Then look for a link to a full-text provider service that will link you to the contents of the e-journal. If the journal is a title we have in print, head to the shelf. When does the library open?